Senator Elizabeth Warren has been an outspoken critic of many things and especially President Trump. I'm sure there are plenty of articles online about her desire to claim Native American Ancestor. 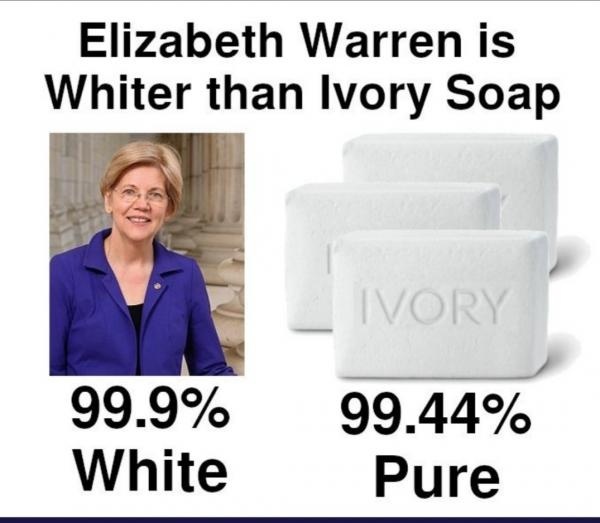 She recently took the Presidents challenge to take a dna test that MAY have offered the slight possibility of a 1.56% ancestry claim which is far from meeting any standard of being credible Native American Indian of any tribe. She used and abused these claims to have minority status to enter prestigious law schools on more than one occasion. My quick comment: Warren said Cherokee because she did not know enough about indians to know there are other tribes, like the Dakota or Lakota tribes, her entire Indian heritage was probably stolen from the song "Cherokee people" so with that song title she at least remembered the name of ONE tribe she could write down and scam with. "A DNA test is useless to determine tribal citizenship. Current DNA tests do not even distinguish whether a person's ancestors were indigenous to North or South America. Sovereign tribal nations set their own legal requirements for citizenship, and while DNA tests can be used to determine lineage, such as paternity to an individual, it is not evidence for tribal affiliation. Using a DNA test to lay claim to any connection to the Cherokee Nation or any tribal nation, even vaguely is inappropriate and wrong. It makes a mockery out of DNA tests and it's legitimate uses while also dishonoring legitimate tribal governments and their citizens, whose ancestors are well documented and whose heritage is proven. Senator Warren is undermining tribal interests with her continued claims of tribal heriitage". The Chief has spoken. ADIOS WARREN!!! Oops! Hillary Clinton Swoops In to Save Sen. Menendez’s Campaign — CRASHES INTO GARAGE PILLAR! (Video) https://www.thegatewaypundit.com/2018/10/oops-hillary-clinton-swoops-in-... I am so grateful she is not the president. If vacs weren't bad enough look at where they are made. The United States has strongly informed the President of Honduras that if the large Caravan of people heading to the U.S. is not stopped and brought back to Honduras, no more money or aid will be given to Honduras, effective immediately! https://twitter.com/realDonaldTrump/status/1052183647552491521 --- I hope all aid is stopped to all countries, charity begins at home. We have homeless vets that should be taken care of. Warren $15 Million Within 6 Years As A Politician? That picture is worth the thousand words, and she wants to make a 2020 presidential run? I think she was setting herself up for a 2020 run. A few others I think are too, booker, harris, biden and sanders.